Young readers can enjoy the detailed illustrations while looking for certain people, animals, or objects on each page. 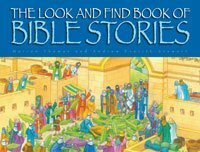 The Look and Find Book of Bible Stories will help children learn about the major events in the Bible from both the Old and New Testament while having fun searching for things in the busy and colorful illustrations. 11" x 8.25", hardcover, 48 pages.